BEIJING, Jan. 31,Chinese Premier Li Keqiang on Thursday said China was ready to tap more cooperative potentials and enhance all-round cooperation with Qatar to benefit the two peoples. The remark came as Li met with visiting Qatari emir Sheikh Tamim Bin Hamad al-Thani at the Great Hall of the People in Beijing. 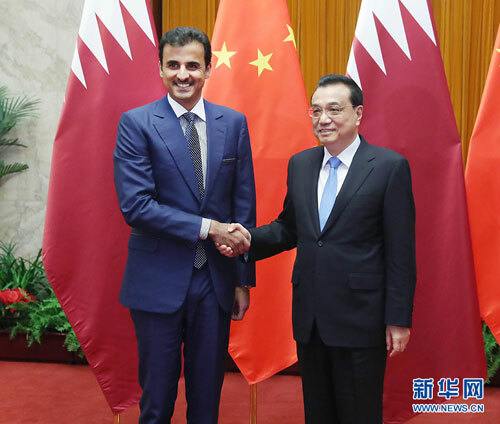 Hailing Qatar as China's important cooperation partner in the Middle East and the Gulf, Li said relations between the two countries had enjoyed healthy and stable development, with cooperation in trade, investment and other fields growing rapidly. Li said China was ready to tap more cooperative potential with Qatar and establish a long-term and stable strategic cooperation partnership in energy. As a developing country, China attracts the most foreign investment and is willing to open basic industry to Qatar to achieve mutual benefit, Li said, calling on the two countries to deepen security cooperation to safeguard regional and world peace. China is ready to work with countries of the Gulf Cooperation Council to start the next round of FTA negotiation as soon as possible and will strive for an early agreement, the premier said. Tamim said that faced with current international political and economic situation, Qatar and China should further enhance cooperation, which was also the purpose of his visit. Qatar is optimistic about China's economy and is ready to work with China to explore new cooperation areas, said Tamim, adding that Qatar hopes to seek more investment opportunities in China and is ready to work with China and other parties to promote the FTA negotiation. He also expressed appreciation of China's active and constructive role in the Gulf region and Arab world, saying Qatar was looking forward to China's greater role in the future.